A. Gigantic Purple Worms based on the D&D monster. B. Juvenile Purple Worms and other smaller random Worms. 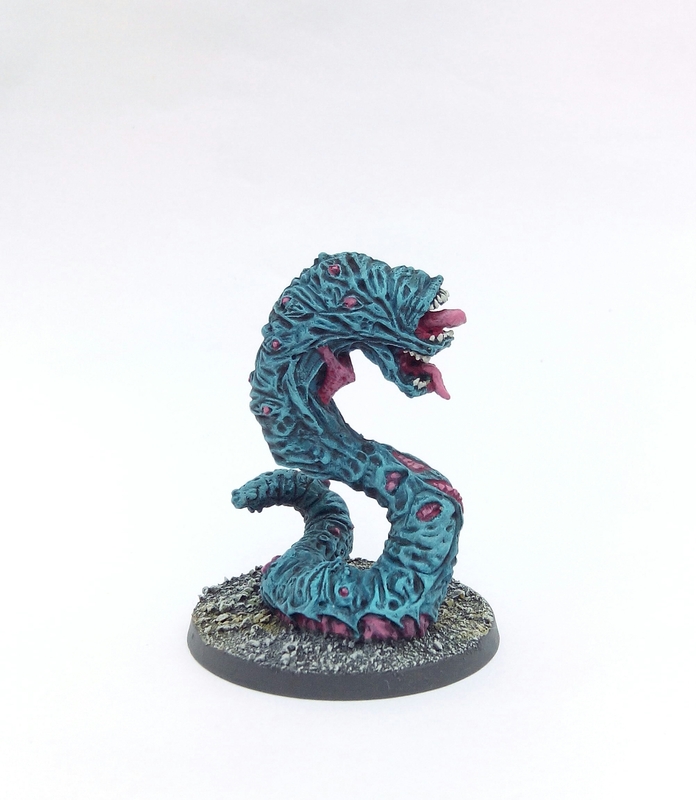 For category A there’s a very impressive Purple Worm D&D miniature sculpted by Charles Woods that is suitably imposing. 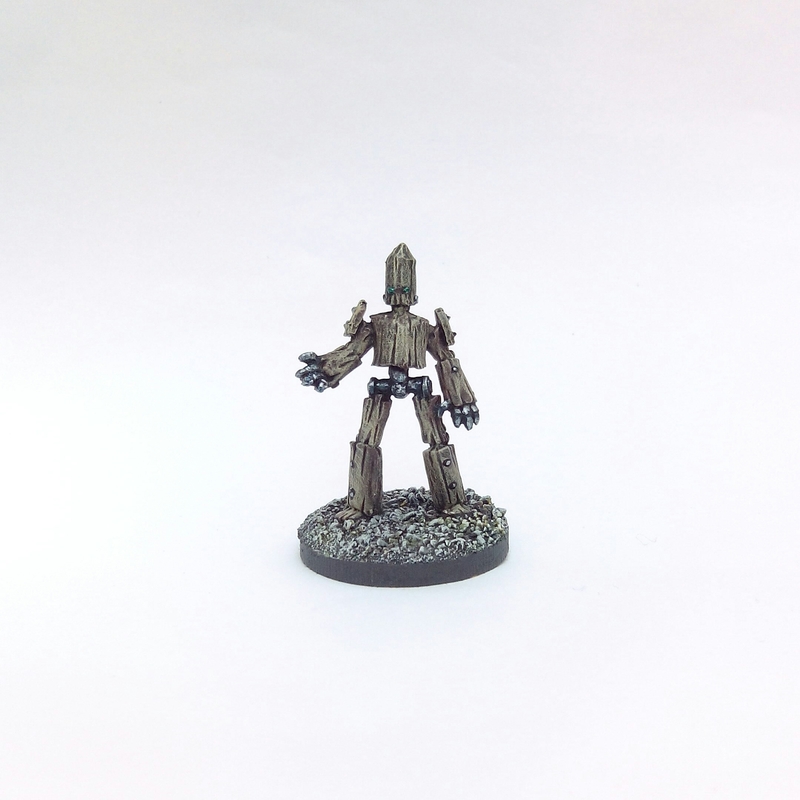 DM Scotty on his YouTube channel theDMsCraft shows how to scratch build something similar to the Charles Woods sculpt. Scotty does a great job on this and if it wasn’t for time constraints I’d be tempted to have a go making one. If you’re unfamiliar with Scotty and his Channel stop reading this now and go check him out instead. 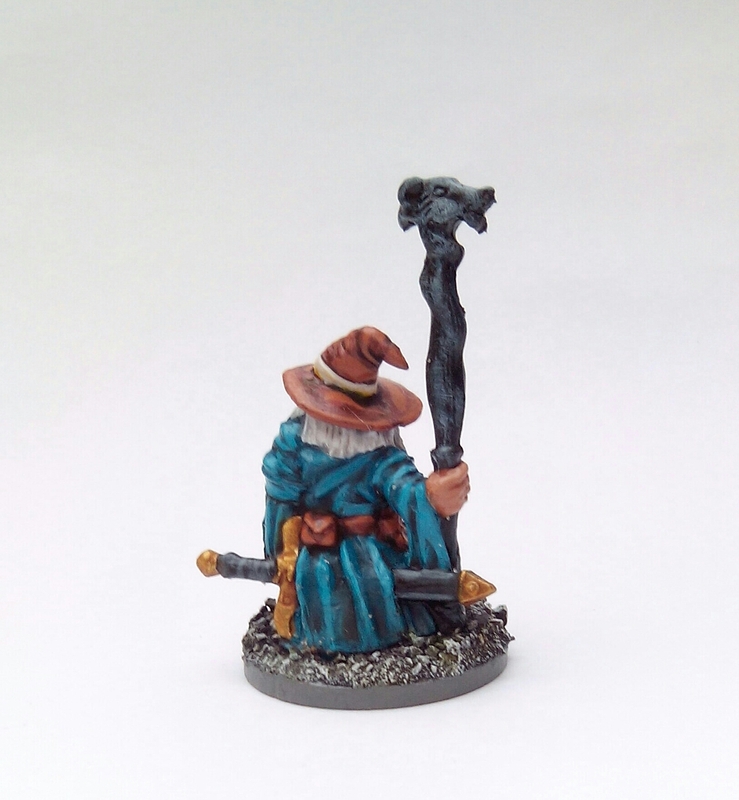 Category B seems to suit Frostgrave better as the Worms in this game aren’t particularly large or high powered. I had a couple of options lined up for this, the front runner being a Worm from the first release of Reaper Bones miniatures. Rather foolishly I kept delaying purchasing this figure and eventually everywhere sold out! 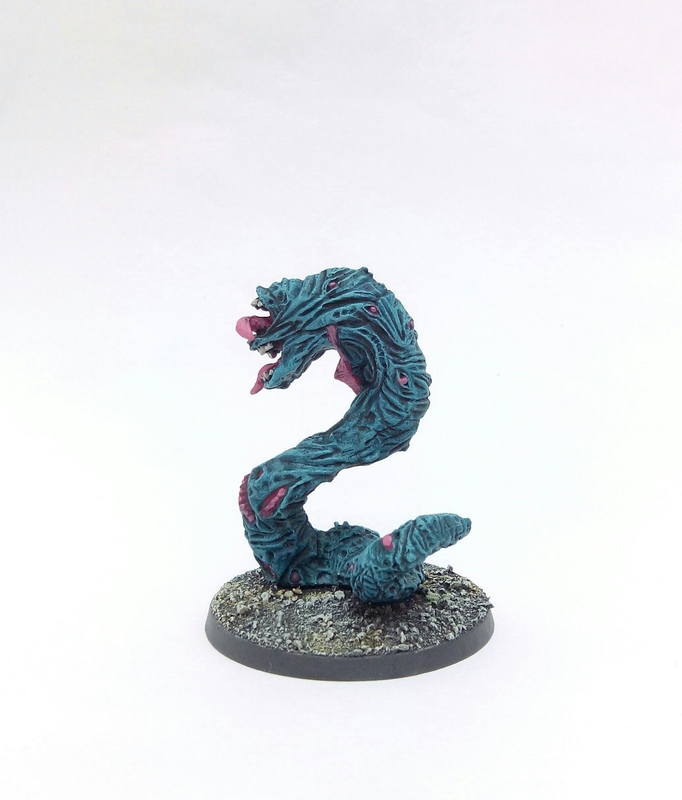 This left me with my alternative choice instead, a Mage Knight Crypt Worm from the early 2000s, still available from Ral Partha. 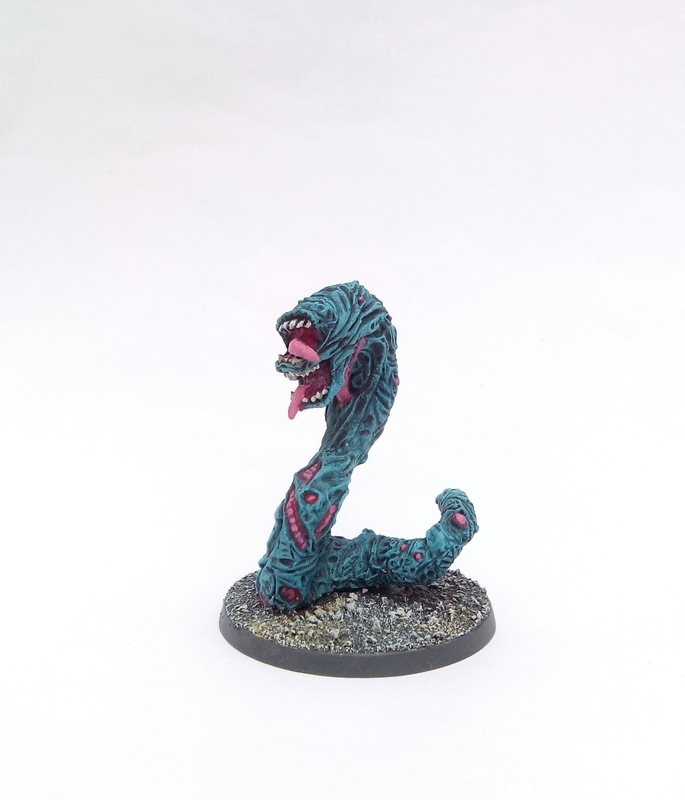 This miniature has a hint of Gigeresque alien and also stirred memories of painting Games Workshop Genestealers about 25 years ago. With that in mind I thought I’d give that old paint recipe a run out for nostalgia’s sake. 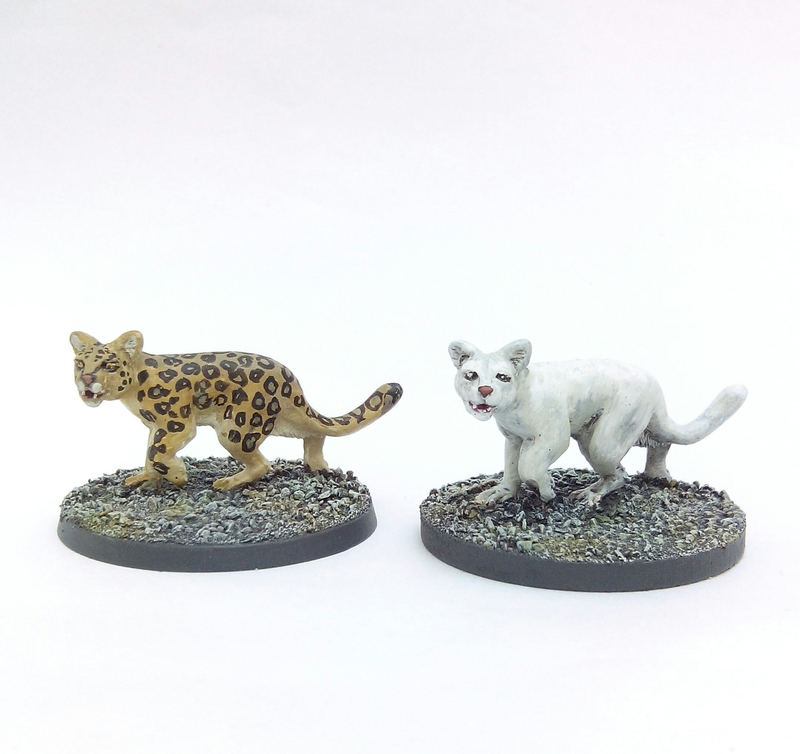 I’ve really struggled to find a Snow Leopard miniature for this project. The ‘official’ miniature is okay but comes with the Ice Toad figure which I’m not fond of so I wasn’t going to buy it. 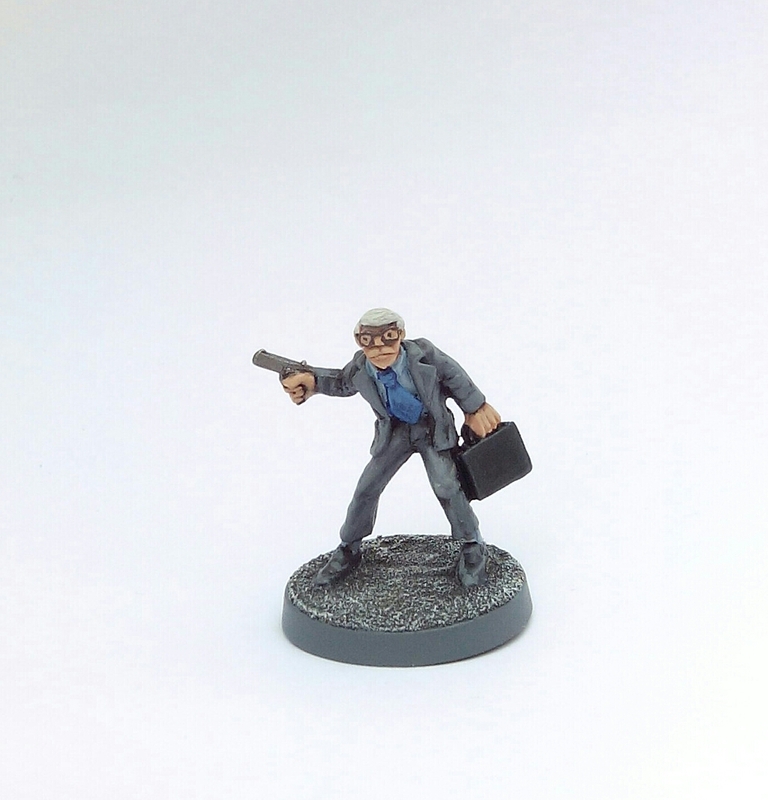 In the end I settled on DeeZee Miniatures Dinofelis of which you get 2 in a pack. Not the best fit and I’m also not too enamoured with either paint job (both are naff) but they’ll do for now. Maybe I’ll get chance to return to the Snow Leopard at a later stage and paint a decent version. So that’s my Frostgrave Random Encounters collection done, just a few more additions to the soldiers to complete before I call the whole project done. I’ll try and get some group photographs of them all over the next few weeks. 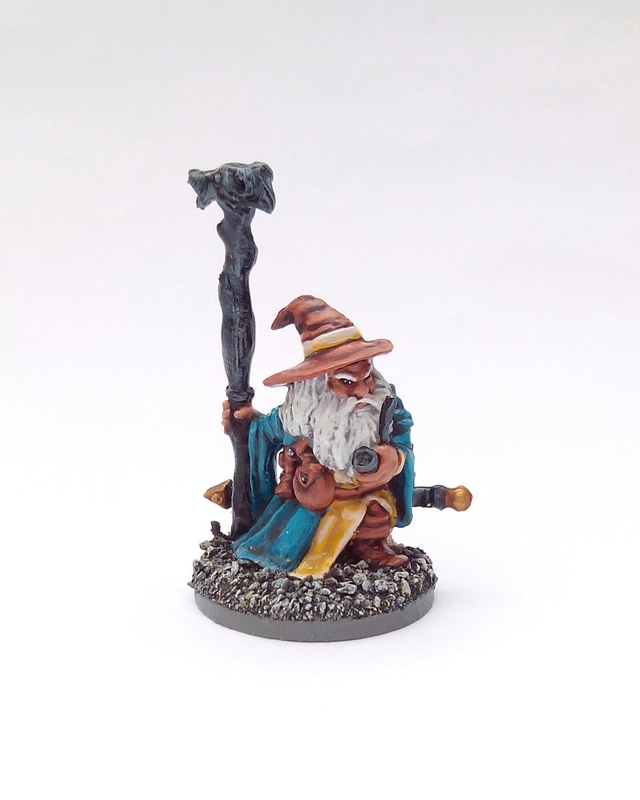 This entry was posted in Post-1990 and tagged dmcraft, Frostgrave, Snow Leopard, Worm on July 30, 2017 by Hobgoblin Orange. 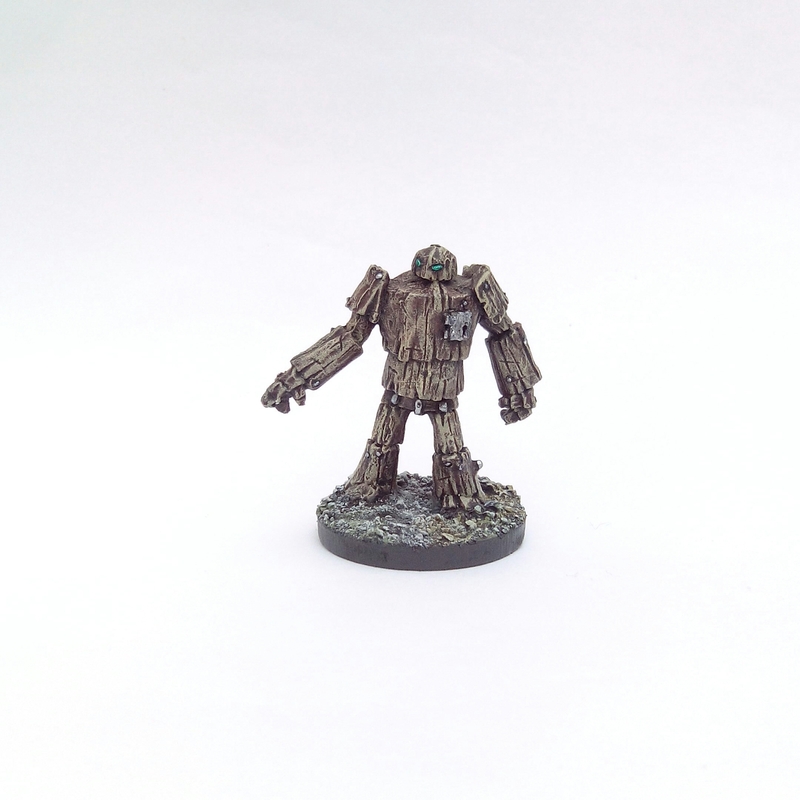 The idea of Constructs as random encounter creatures in Frostgrave seems a bit odd to me. I’d have thought they’d be much more suited to specific areas/scenarios as guardians, put there by sorcerers and only activated by trespassing intruders. 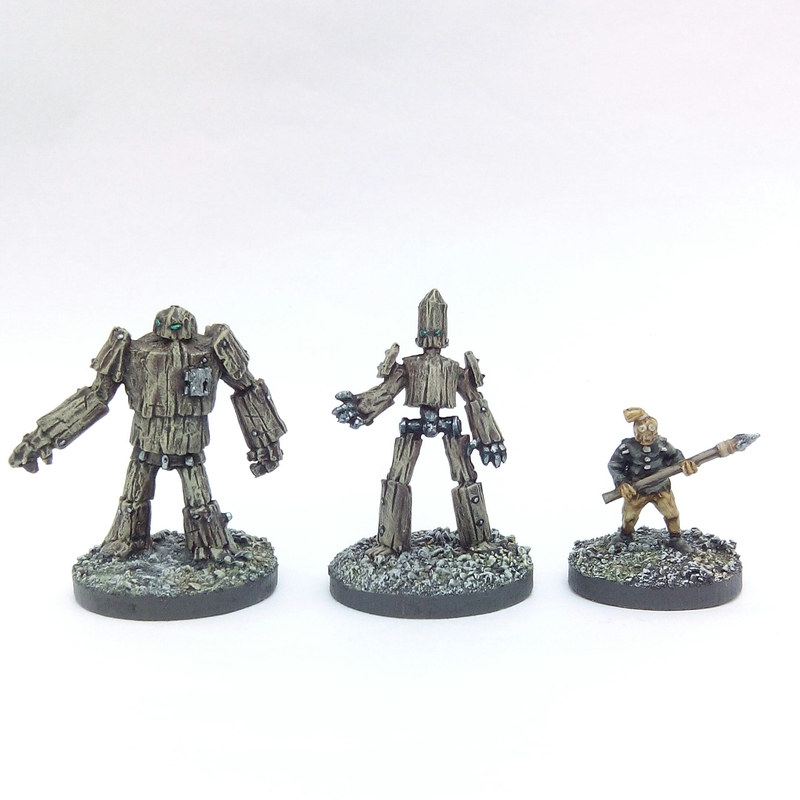 Still, they’re on the random encounter table so I needed three – small, medium and large. I looked around for alternatives to the official figures as I’m not overly fond of them but nothing really seemed suitable. Everything I found was either too elemental, too robotic and quite often just too big. 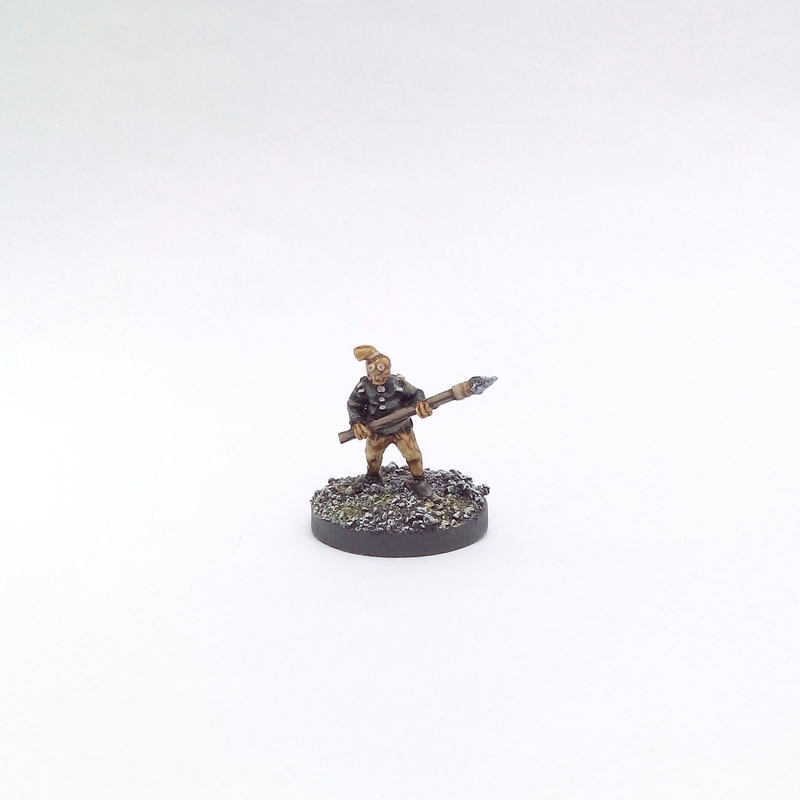 So avoiding steam powered Robots, pumpkin headed Scarecrows and rock Elementals (all options that were considered) I decided to just bite the bullet and buy the ‘official’ Frostgrave North Star figures from my FLGS. The first thing that struck me when I saw them was how small they all are (the photographs from North Star are quite deceptive) and also just how little difference in size there is between the medium and large versions. 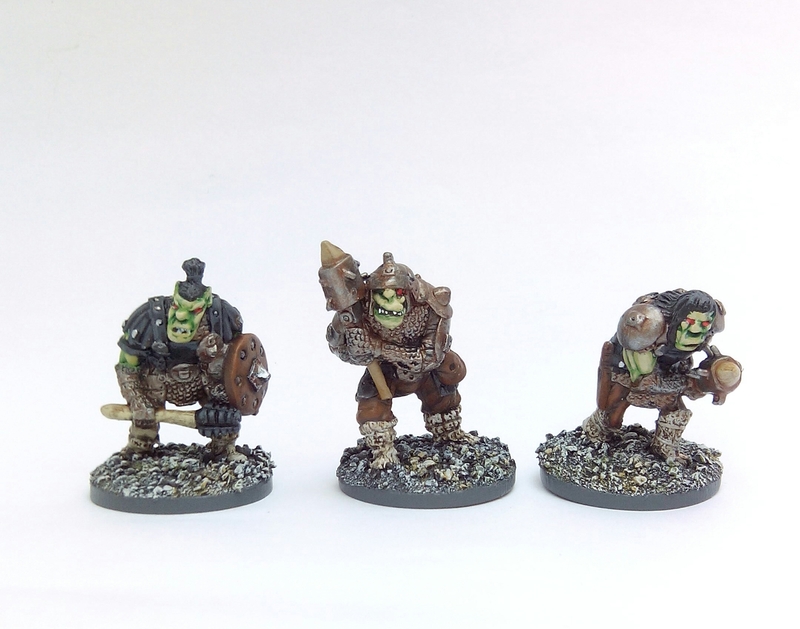 The smallest is based on a 25mm whilst the other two are on 30mms. This just leaves the Worm and Snow Leopard from the rulebook random encounter table and then I’m calling my Frostgrave project complete – for now! 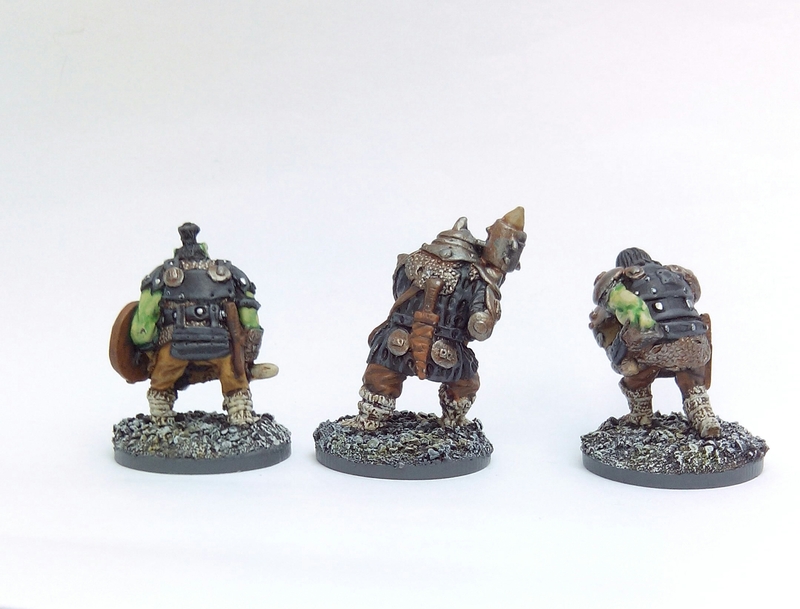 This entry was posted in Post-1990 and tagged Construct, Frostgrave on July 23, 2017 by Hobgoblin Orange. 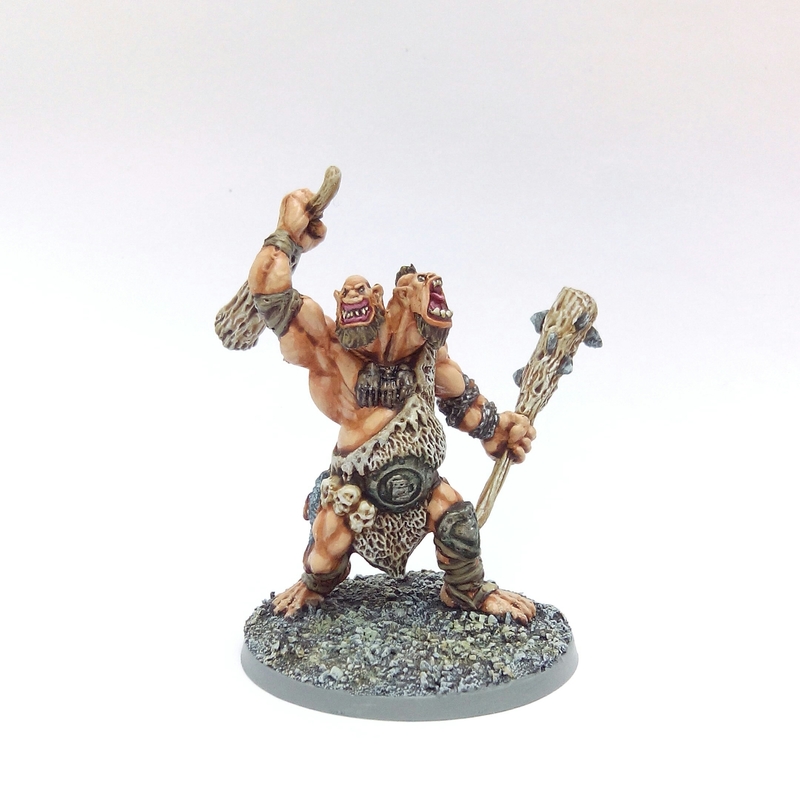 I must have first read fluff about Ettins back in the 80s (either in a friends copy of the 1st Ed AD&D Monster Manual or Dragon Magazine) but I don’t remember seeing an Ettin miniature, or at least a semi decent version of one, until the early 90s. 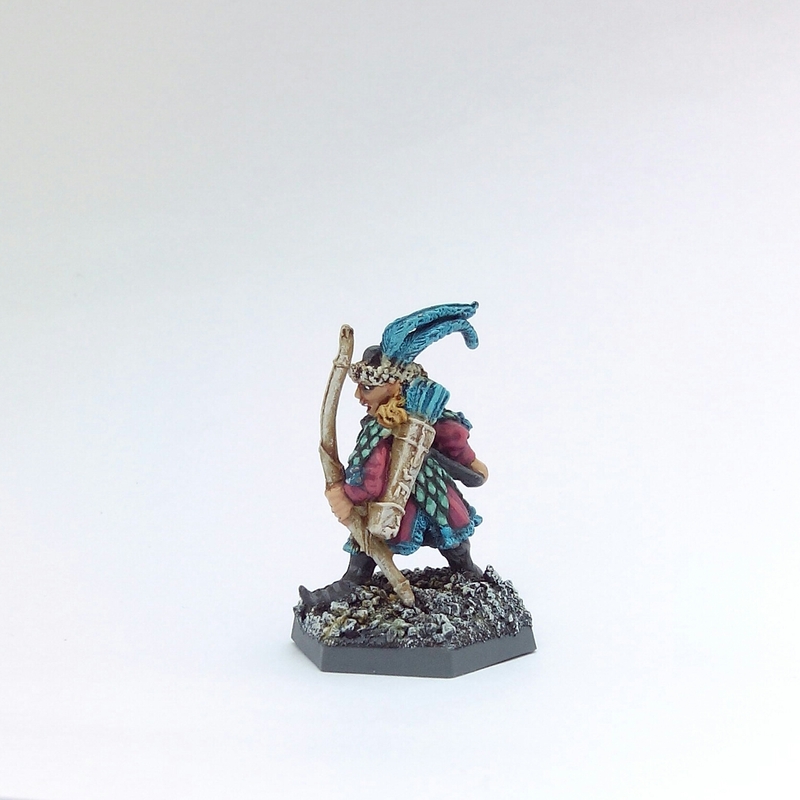 Back then the one that caught my eye was from the Ral Partha official AD&D range. There were a lot of great minis in that series and it sported various classic AD&D adversaries including several splendid looking Giants. 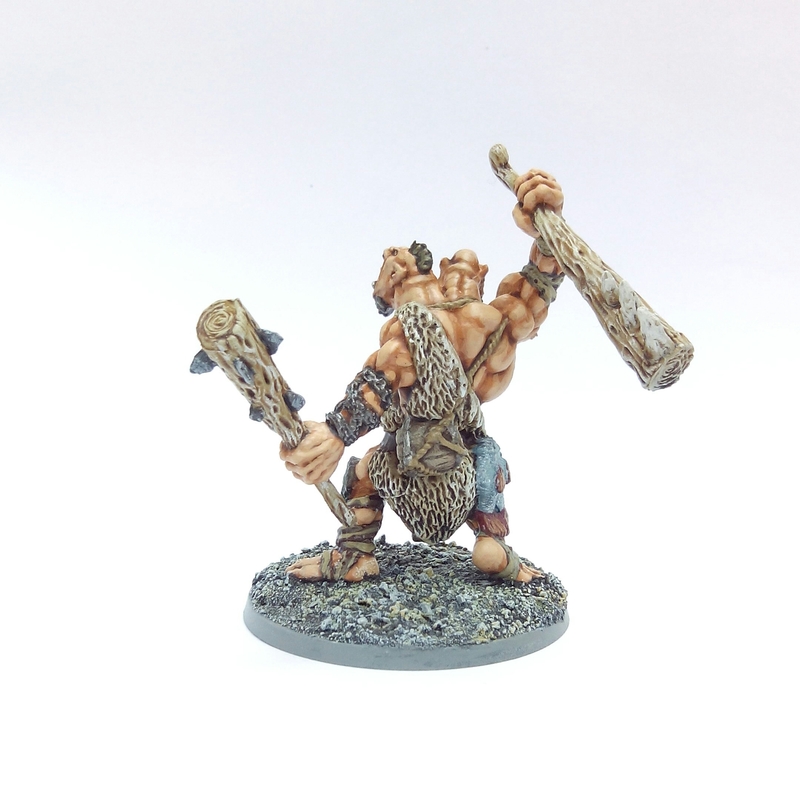 I have one of the Fire Giants from this range tucked away somewhere still to paint and have already put the Firbolg on the blog however the Ettin from Ral Partha was slightly disappointing. it was a bit too barrel chested with spindly, overly long arms and legs for my preferences. I’ve seen a few of these for sale on eBay but as I’ve never been too convinced by the sculpt I haven’t ever bid on one. 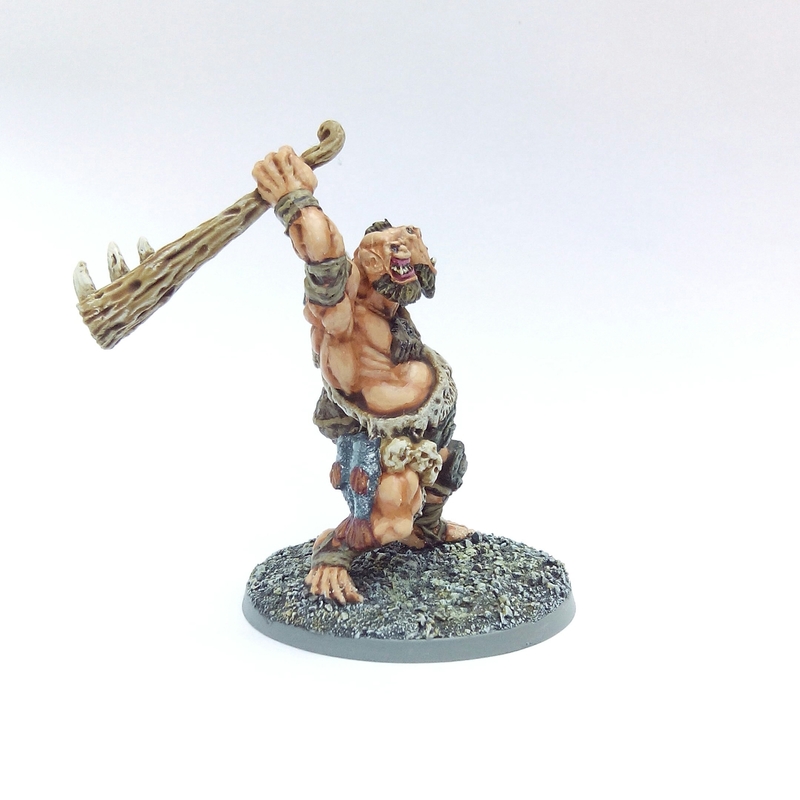 Reaper released their version of the Ettin a few years ago in their Bones range. 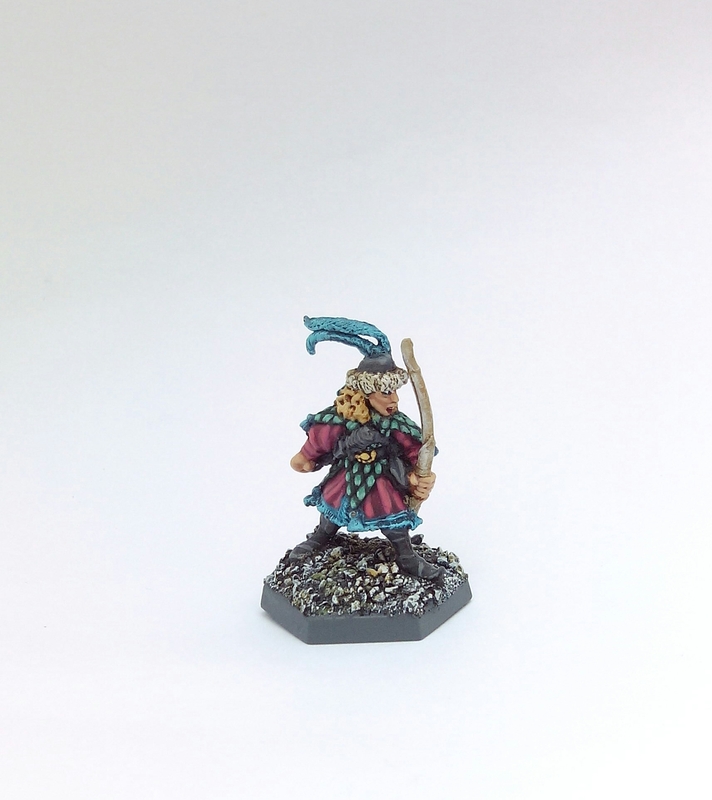 I thought it was much better proportioned than the old Ral Partha miniature so I picked one up. As with a lot of Bones minis it was slightly too bent over so I had to do the boiling water/iced water trick to straighten it up a bit. It’s since bent back a bit towards the original pose but nothing to worry about, and since it’s now secure to a 50mm base it won’t keep falling over at least! Some of the detailing is a bit poor as sometimes happens with Bones plastic. In this case the barrel on its back, the fish and some of the skulls hanging from the waist are a bit ‘blobby’, but not enough to detract from the mini overall. I’m sure it’ll provide a useful distraction to my D&D players at some point! 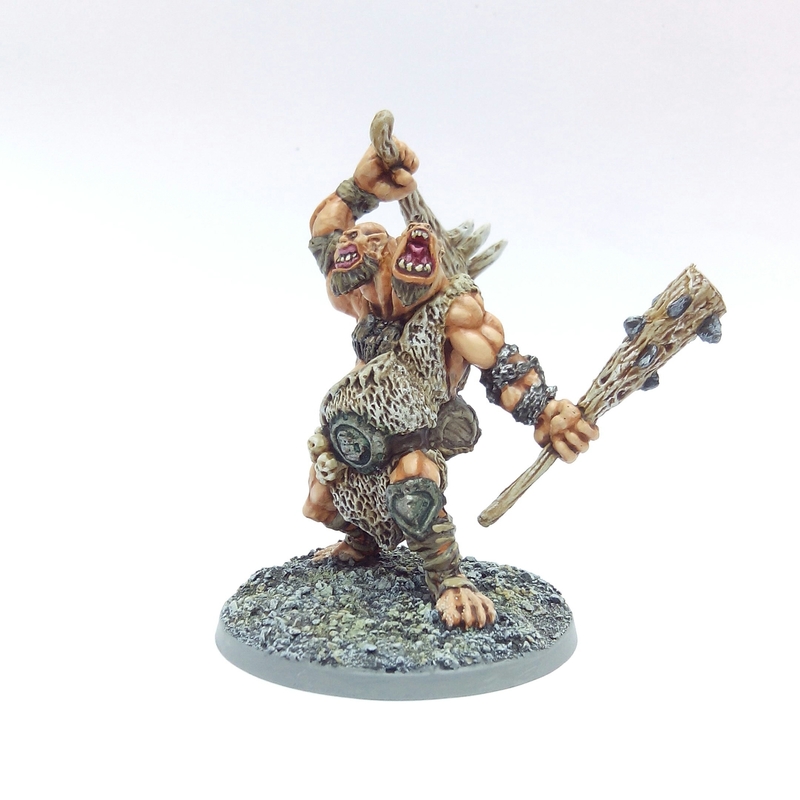 This entry was posted in Post-1990 and tagged Ettin, Ral Partha, Reaper Bones on July 9, 2017 by Hobgoblin Orange.